Rome the Eternal City, a city of conflicting experiences: huge, chaotic, noisy, sometimes dirty but beautiful , breathtaking on an early Sunday morning when the Romans are still asleep and no traffic around. I believe you can only love it or hate it. Living here or simply visiting this city can really be an adventure sometimes! Hundreds of churches, fountains, historical buildings, museums and archaeological sites : it’ll be my pleasure to show you the best of it ! My tours are normally on foot, which is probably the best way to explore Rome. But if you only have a very short time or walking is not for you it would be helpful to hire some private transportation, taxis or to use public transport. I offer customized tours, not fixed itineraries: you tell me what you want to see and I’ll offer my advice. A relaxing stroll through the city, an in-depth visit of the Roman antiquities, a visit to major museums, a gastronomic experience to taste the local flavours. Classic Rome: for a tour of the ancient heart of the city it is normally recommended to visit the Colosseum, the Roman Forum, Palatine Hill and Pantheon. The Colosseum was the great amphitheatre built by emperor Vespasian in 72 AD to house animal hunts and gladiator combats and could contain some 65.000 people. Admission fee. (Colosseum ticket includes entrance to the Forum and Palatine). 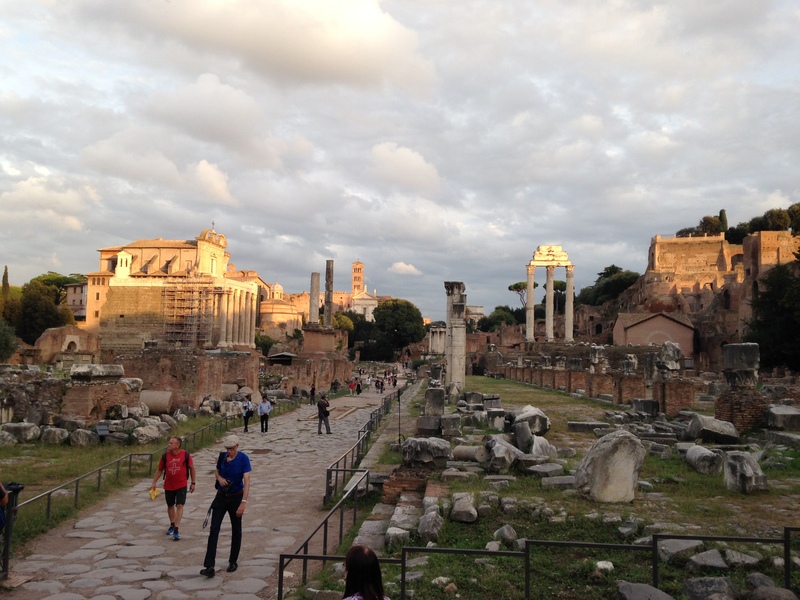 Roman Forum: the central square of ancient Rome for politics, religious ceremonies and triumphal parades. Inside this area, excavated in modern age, are ruins of ancient buildings such as the temple dedicated to Julius Caesar after his death, the temple of Vesta, the Senate house, the Arch of Titus. Admission fee. Palatine Hill: the cradle of Rome, where the legendary foundation of the city took place and where the Roman emperors had their magnificent palace. Admission fee. Pantheon: a 2nd century AD temple dedicated to all the major gods, later turned into a Christian church. One of the greatest architecture in the world especially for its dome. Free admission. Vatican : the Vatican is a huge area that comprises the Basilica of Saint Peter’s, the Vatican Museums , the Sistine Chapel, the Gardens , the Necropolis , the Pope’s Palace and other buildings not open to the general public. Generally a basic tour of the Vatican including only the Museums highlights, the Sistine Chapel and St. Peter’s basilica is approx. 3 hrs long . Here is a list of the different sections in the Vatican, some can be combined together but visiting all this ares in one go it is nearly impossible since it’ll require a long day. The Raphael Rooms and the Sistine Chapel are part of the Museums complex. The Raphael’s rooms were the apartments of Pope Julius II and were painted by Raffaello Sanzio and his assistants. The Sistine Chapel was built to be the chapel of the Pope’s Palace and houses superb paintings by some of the Renaissance masters such as Botticelli, Ghirlandaio and Perugino and the world famous masterpieces by Michelangelo: the ceiling and the Last Judgement. St Peter’s Basilica, this immense church built on the tomb of the apostle Peter in more than a century is the centre of the Catholic world. Open everyday to visitors. Free admission. Saint Peter’sTreasury: inside the Basilica, on the left aisle, enter the Sacristy and you’ll find this museum which contains mainly church ornaments, statues, papal mitres and other precious objects. Admission fee. Christian Rome: Rome has 4 major basilicas: St. Peter, St. Paul outside the Walls, St. John in Lateran and St. Mary Major. They’re all open daily . Free admission. St Clement: a church on three levels. An upper church dating back to 12th century which was built over the previous basilica of the 4th which at his own turn was built over some Roman houses dating back to the 1st century AD. Exploring the two underground levels is like travelling through Rome’s history. Admission fee to the underground levels. St. Ignazio: dedicated to the Jesuit saint this beautiful baroque church is famous for its trompe l’oeil dome. Free admission. Baroque Rome: a stroll through the major squares of Rome where the 17th and 18th century artists created their masterpieces. Trevi fountain is probably the most famous of the Roman fountains. Built in 18th century by Nicola Salvi is fed by an ancient Roman acqueduct. Do not forget to toss your coin in the water! Spanish steps a very scenographic stairway built in the 18th century to connect the hilltop area to the rest of the city. It gets its name from the nearby Spanish Embassy. In April it is all coloured by the marvelous display of azalias.The area near the steps it is also famous for the elegant and expensive designer stores. Fountain of the 4 Rivers and piazza Navona this square was in antiquity the site of a Roman stadium built by emperor Domitian. Its oblong form still recalls the stadium shape. At the centre Bernini created the fountain of the Four Rivers. Every year at Christmas time there is a traditional fair (not that traditional anymore, alas!). Borghese Gallery: set in one of the largest Rome’s public parks this gallery is really a gem. The palace built in the 17th century by the powerful cardinal Scipione Borghese houses some of the masterpieces of Bernini, Caravaggio, and Raphael. The collection is beautiful and not exhausting at all . Reservation is required. Admission fee. Admission is based on a 2hrs slot. Capitoline museums: the oldest public collection in Rome. Antiquities, marble and bronze sculptures: amongst the famous artworks the Capitoline She Wolf, Marcus Aurelius equestrian statue, emperor Costantine’s statue gigantic marble fragments.There’s also a painting collection. Cafeteria with nice view over the city. Admission fee. Museo Nazionale Romano : the Roman National Museum is divided in different buildings(see below). Admission fee. Terme di Diocleziano(Baths of Diocletian): in the area of the former Baths of Diocletian the museum houses antiquities such as tombs, utensils and earthenware from the pre-Roman settlements. There is also an important epigraphic collection with inscriptions on marble, metal, and brick. It is possible to visit one of the huge halls of the the ancient baths ( do not miss the Aula X /Hall # 10 before leaving the museum). The magnificent cloister with garden probably after Michelangelo’s design is a silent oasis in the noisy city: you can sit here peacefully reading your guidebooks and making plans for your next visit . Castel S. Angelo:this is a mausoleum/fortress/jail/museum. The perfect explanation to Rome’s nickname: the eternal city. iIt will be worth your while only for the stunning view from the top. Admission fee. Ara Pacis: a marble altar with extremely refined carvings dedicated to the emperor Augustus is now displayed in a contemporary architecture designed by Richard Meier. Admission fee. We are in Rome (a family of 5) on Sunday morning 10 July and then again Sunday afternoon 17 July and want to do an underground tour of the Colosseum with an English speaking guide? can you help us there? My grandmother and I took a tour of the Vatican with Alessandra during our two week trip of Rome. Piece of advice, BOOK ALESSANDRA! 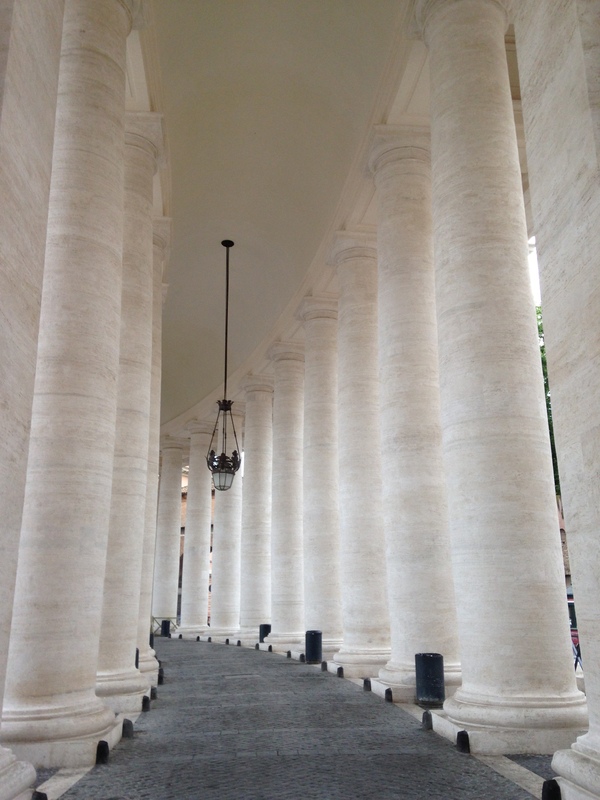 She was a joy to have guide us through what can be an overwhelming attraction of Rome. We learned SO much and had a great time as Alessandra told us stories and the history of the Vatican. Our three hour tour felt informational and I’m sure we wouldn’t of felt as comfortable without her as our guide! It was also fantastic having a smaller group to tour with as our experience was intimate and we felt cared for. Thank you Alessandra! We totally agree. Our neighbors used Alessandra on their Vatican trip in July 2017. It was our great fortune to engage her for three of the most informative and fun hours of our life. She is is a WIKI of information!